Hope you are having a wonderful saturday everybody. My boys are feeling a bit better during the day, so we spend a lot of time outside, playing and enjoying the sun. We have a 60 year old large tree, which provides a wonderful shadow for almost the entire garden. Because of the terrific weather I was in the mood for a summer card with bright and shiny colours. 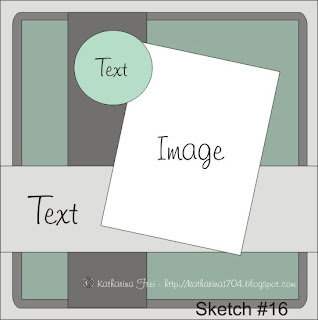 I used the adorable High Hopes Leilani and the supplies of the Card Art card kit of June to put my layout together. The gardenias are cut out and arranged on foam blocks at the bottom of the motive. Therefore this card also qualifies for this weeks Saturday's Workout challenge. Wegen dem schönen Wetter war ich in der Stimmung für eine sommerliche Karte mit kräftigen Farben. Ich habe die süße High Hopes Leilani und den Inhalt des Card Art card kit von Juni verwendet um mein Layout zu gestalten. Die Gardenien sind alle ausgeschnitten und mit Abstandshaltern rund um das Motiv drapiert. Damit qualifiziert sich meine Karte auch für die Saturday's Workout challenge dieser Woche. I also did another sketch with my layout for you to use. Maybe you like it and want to give it a try :) If so, please leave a comment under this post, I would love to visit your blog to see what you have created! 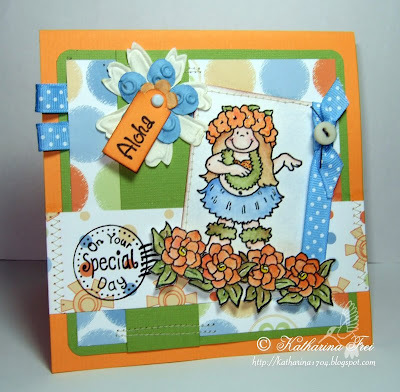 Gorgeous card Katharina Love the Fab HH stamp and the colours you have used. Oh Katharina was für ein supersüßes Kartenwerk. Die Farben sind superklasse und der Sketch ein Traum. Vielen lieben Dank für dieses wunderschöne Kärtchen zu Saturday´s Workout. A beautiful summery and hot card...great details...love the colours used. So glad to hear that the boys are feeling a little better and are able to get out to have a play...bless. love the sketch Katharina, will have a go at that one soon. Fab card i love the cute HH image and the papers. What a fabulous card, Kathrina. The colors are wonderful. eine supersüße Karte, wunderschön, tolle Farben, ein toller Aufbau. What fun colors and patterns! 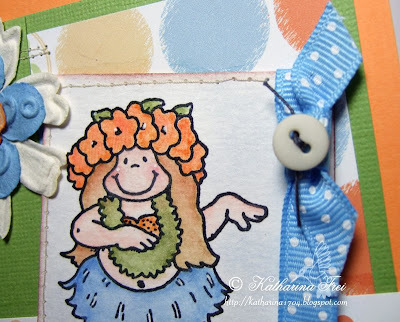 I love your hula card! Such a fresh and happy card for summer!! Your sketch is wonderful, and your card is fabulous! ohhh looooooove it! the card is amazing! I sure will give it a try!!! Fun sketch! I love your card!! Your work is wonderful!! Hugs, Christelle. Lovely card Katharina!! And thanks for the sketch, I will use it later ... because time is always a problem! WOW she so cute, lovely summer colours. Das ist wieder total wunderschöne Karte geworden!!! Oooh Katharina, die Karte ist wunderschön und so süüß gemacht. Die Farben und das Motiv sind ja sowas von klasse. Der Sketch gefällt mir super gut und toll wie du ihn umgesetzt hast. Wow!! this is So Gorgeous!! I love the colors you choose here!! your coloring, fabulous sketch and accents!! Gorgeous card - I love that image, she is adorable. Great bright summery colours too. Glad your boys are feeling better, my Ellie is almost back to normal too! Will have a go at your great sketch today. You just keep amazing me with all the fabulous designs you keep coming up with!! This one is no exception. I'm going to have a bash at this sketch. It looks great! So pleased the boys are improving Katharina! this is such a fun card!! love the colors you chose and that adorable image! Also love the sketch, so I made a card using it. Hallo Katharina, ich habe mich von Deinem Sketch inspirieren lassen und ein Kärtchen gewerkelt. Zu finden auf meinem Blog.